My wife and I have a deal going on -- if she cooks, then I wash the dishes. If I cook, then she washes the dishes. Both of us hate washing dishes, especially the frying pan which absolutely cannot go in the dishwasher (we tried it once but destroyed a non-stick frying pan in the process). Recently, we switched to a cast-iron frying pan after our white ceramic frying pan turned brown and lost its non-stick functionality. It was a $25 investment that lasted for 6 months. We thought about switching to cast-iron after hearing from friends about not needing to wash such cookware after cooking. Oh man, what a dream come true! 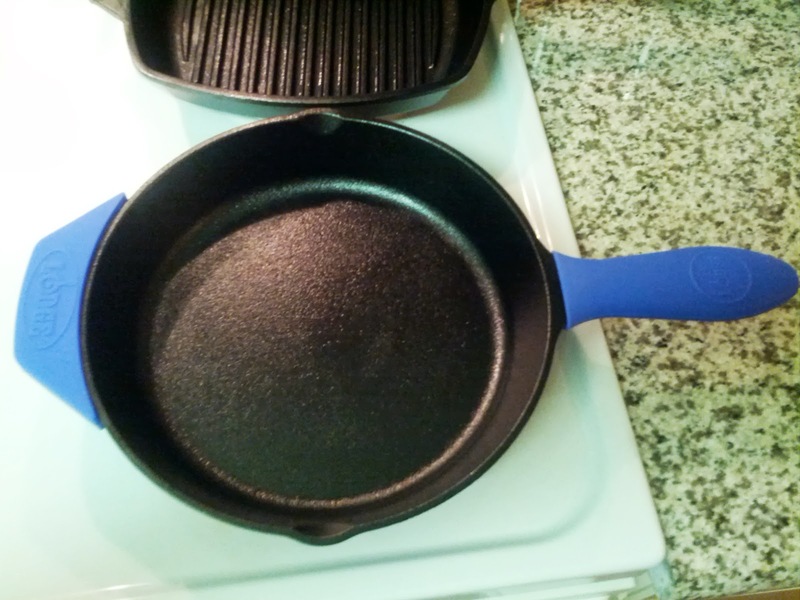 Above is a picture of our cast-iron -- a Lodge Logic 10" Skillet (here). It costed $16 when we bought it. The blue rubber handles are separate accessories that we purchased to avoid burning our hands when touching the handles. The main appeal of using cast iron is that after cooking, you don't need to wash it. Okay, you should probably rinse off/towel off any food bits if you want to avoid cockroaches, but otherwise, you want whatever oils from what you last cooked to dry onto the surface. We found it easy to rinse the skillet in hot water just after cooking. Then towel it dry and dab a bit of oil onto the surface. Note: If you wash the skillet with soap, the coating of oil will come off and you'll have to re-season the skillet which takes at least an hour. It's heavy as hell to lift. My wife finds it impossible to lift. There's a lot more smoke when cooking. The skillet gets hot and stays hot for a longer period of time. Don't fry with olive oil or oil the skillet with olive oil. Olive oil has a low-smoke point and isn't healthy when it breaks down at temperatures above the smoke point. Use grapeseed oil or oils with higher smoke-point temperatures. You'll need to buy a good pair of oven mitts or purchase rubber handles for the skillet. You'll need to tell over-zealous family members NOT to wash your greasy skillet if they attempt to help you clean your kitchen (has not happened to us yet :-)). I'm looking forward to cooking with the cast-iron tomorrow. It's a lot more fun to cook now that I don't have to clean as much. One thing that I find myself doing a lot of on my spare time is trying to improve my efficiency when coding. At work, my editor of choice is vim. A lot of people use eclipse, but I like vim because of it's customizability and simplicity.